Become an SoC expert and supercharge your career by learning about the many functions of the Avnet Ultra96 during this virtual workshop. 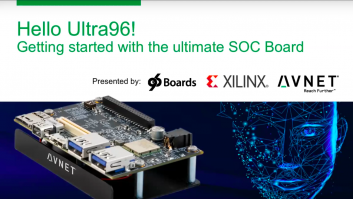 Purchase the Ultra96 board to participate in the hands-on labs. No other fees required. The Ultra96 board combines quad-core ARM A53 64-bit processors, dual-core R5 32-bit processors, a Mali GPU and Programmable Logic along with WiFi, Bluetooth, and other IO for interfacing. 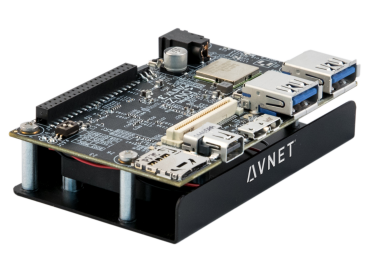 This makes it a very useful board for a range of applications from IoT & IIoT to image and signal processing and a lot of applications in between. This board is based on Linaro's 96Boards specifications that are open and ready to be used with a wide range of peripherals and acceleration engines in the programmable logic that is not available anywhere else. This career enhancing workshop is free. However, this is a hands-on workshop and will require you to purchase an Ultra96 board for the full experience. Click on the BUY HERE link to purchase yours today! Adam Taylor is an expert in design and development of embedded systems and FPGAs for several end applications. Throughout his career, Adam has used FPGAs to implement a wide variety of solutions from RADAR to safety critical control systems, with interesting stops in image processing and cryptography along the way. Robert Wolff is a technical writer, open source evangelist, community leader and engineer with a history of working in and around esteemed academic institutions and STEAM (science, technology, engineering, art and mathematics) based educational programs. Right now, Robert works as a community manager for 96Boards at Linaro. He helps monitor and maintain several of 96Boards' Open Source orgs and repositories, runs a variety of community driven projects/initiatives, and hosts a live, weekly online video "podcast" called "96Boards OpenHours." Tomas Evensen is Chief Technology Officer, Embedded Software at Xilinx. In this role he is responsible for the embedded software strategy for Xilinx SoCs. Prior to joining Xilinx, Evensen was Chief Technology Officer at Wind River for 7 years, as well as GM for the Wind River Tools Division and VP of Engineering for the VxWorks operating system. Before that he was the creator of the Diab Data C/C++ compilers. Evensen received his MSEE at the Royal Institute of Technology in Stockholm, Sweden. All participants in the live event will receive a personalized certificate of completion.